One of the more challenging tasks in dentistry is to match the shade for a single tooth. As you can see with the following examples of single tooth veneers, it definitely can be achieved. We communicate with the dental laboratory with detailed prescriptions and send along digital photographs to achieve the best esthetic result. This patient fractured his left front tooth in childhood and had numerous large bonding fillings placed over the years. Tired of the wear and stain on the filling, he decided to have a porcelain veneer placed. This patient fractured his right front tooth in childhood as well and had numerous large bonding fillings placed over the years. Tired of the wear and stain on the filling, he decided to have a porcelain veneer placed. This patient suffered a fracture of his left front tooth during a sporting event and had it restored with a large bonding filling. After a few years he decided to replace the stained filling with a porcelain veneer. One option for replacing a missing tooth is with a Maryland Bridge, by a bridging piece which is glued to the backs of the adjacent teeth (as opposed to an ordinary dental bridge which is attached by reshaping the adjacent teeth and covering them). 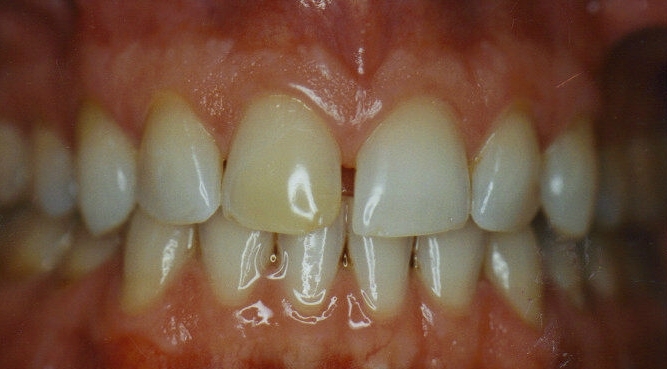 The Maryland Bridge is considered to be an ultra-conservative treatment with minimal grinding of the adjacent teeth. This same patient also had a congenitally peg-shaped upper left lateral incisor. The tooth was crowned in order to improve the shape and esthetics. This patient suffered trauma to her left front tooth which required a root canal procedure and was repaired with composite resin by her previous dentist. She was not happy with the stain around the filling. The tooth was restored with an esthetic ceramic crown called EMPRESS.